SEOUL: A North Korean soldier was shot and injured by his own side Monday while defecting to South Korea at the truce village of Panmunjom, the South’s military said. The soldier crossed to the South side of the Joint Security Area at Panmunjom, the only portion of the border Demilitarised Zone where forces from the two sides come face-to-face, the Joint Chiefs of Staff said in a statement. “Our military has taken in a North Korean soldier after he crossed from a North Korea post towards our Freedom House,” the statement said, referring to a building on the South side of the village which is bisected by the border. The defector was taken to hospital after being shot by another North Korean soldier, the South’s military said. Details of his condition were not immediately available. Military defections across the heavily fortified DMZ dividing the two Koreas are not uncommon, but they are rare at Panmunjom — a major tourist attraction. Two North Korean soldiers defected to the South in June after crossing the frontier at another location. 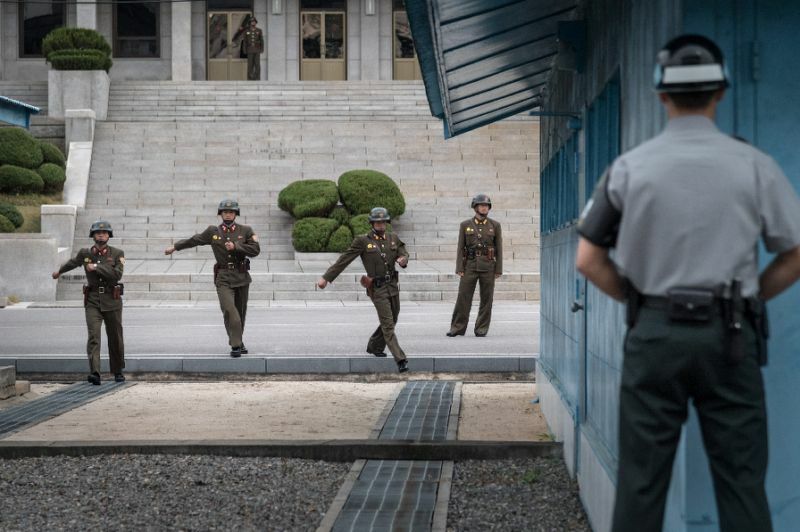 Over the decades since the peninsula was divided, dozens of North Korean soldiers have fled to the South through the DMZ, which extends for two kilometres either side of the actual borderline. Relations between the two sides have been tense for months, as the North stepped up its missile tests. In September the North carried out its sixth and largest nuclear test, of what it described as a hydrogen bomb.